Above all else, New York is a drinking town. Here, where the locals go for a tipple. New Yorkers love a drink. And being an open-minded bunch, they embrace dives, wine bars, and cocktail joints in equal measure, meaning you won't go wrong when looking for a place to knock back a few. Read on for our picks for some of the best places to drink in NYC. Get dressed, for you are going someplace fabulous and transporting. You’d be forgiven if your internal GPS went on the fritz in this knockout room, which recalls the Hall of Mirrors thousands of miles away. With giant crystal chandeliers dangling overhead, Champagne served in lead crystal flutes that are heavy in the hand, and scarlet walls that recall the City of Lights’ most refined rooms, this bar is a beauty. 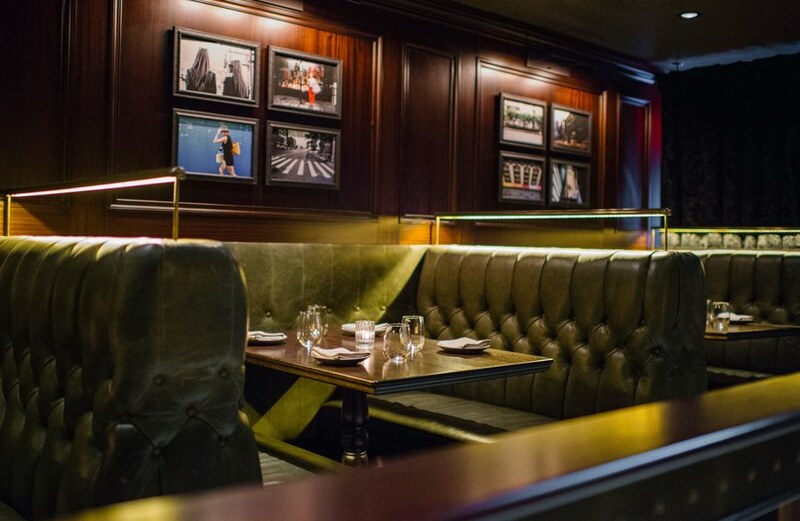 Bar stools are more like thrones; it’s hard not to feel like royalty when you're here. Daylight floods in through sprawling old windows at this century-old watering hole ideal for day drinking. A welcome break from the comedy club-hawking flyer guys of Greenwich Village, Dante was established in 1915, and after a century it snagged new owners, a co-owner with heavy cocktail cred (Naren Young), and a faded grandeur vibe that conjures its famous regulars—Patti Smith, Hemingway, Anaïs Nin—of yore. There are aperitivi and Bellinis, obscure Amaro and bitters, and a “Negroni Sessions” menu for which its fans flip. Come here—a minimalist shelter from the storm of Lower East Side partiers—for okonomiyaki, sleek Japanese design, and excellent highballs. Kenta Goto, owner and barman, was once at Pegu Club, and has retained that famous bar’s excruciating attention to detail. It shines in his highballs—look for anything with yuzu—and the delicate coupe cocktails, such as one made with a rosy cherry blossom, sake, gin, and maraschino. The food here is not an afterthought. The okonomiyaki—that killer Japanese izakaya drinking standard of fried cabbage and kewpie mayo, dancing with bonito flakes and stuffed full of pork belly, rock shrimp, and squid—is some of the best in town. When some of New York City's elite publishing companies moved downtown, their new neighborhood required great hotel bars for those with expense accounts and a story to tell. Thank goodness for the Beekman. Because it’s in a hotel, you might land a seat at the bar—a gorgeous number with teal stools and a green-and-gold motif—between a Vogue editor and a tech millionaire here from Dubai. This is a proper cocktail spot; look for the James DeVille, a bracing bourbon and absinthe cocktail that seems to suit the glimmering, low-light decor. Or go for beer; there’s a solid list on tap. Hotel bars are nothing new, but the NoMad Bar—just around the corner from the NoMad Hotel on Broadway—takes the bar to another level. 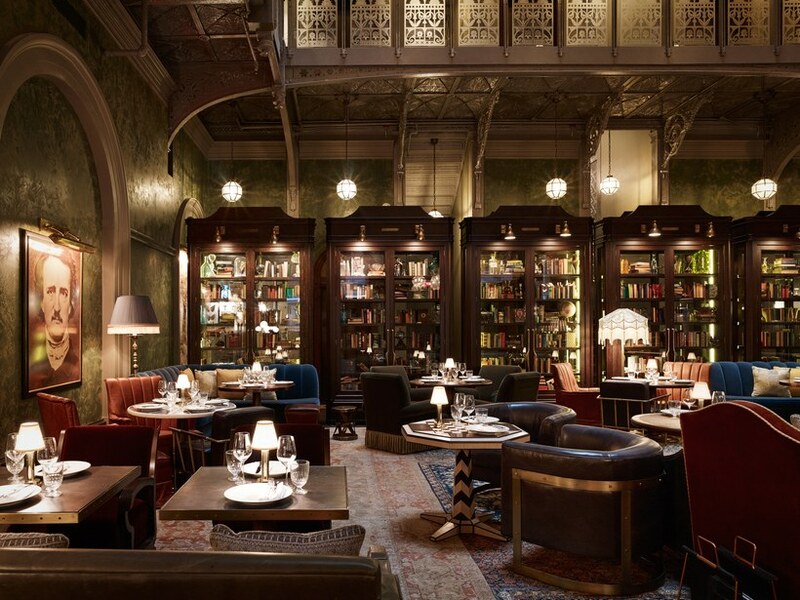 The bi-level space echoes the hotel’s design, with dark wood and plush leather seating that makes you feel as though you’re drinking in someone’s old library. The menu is more low key, with bar bites like bacon-wrapped hot dogs and a riff on the hotel restaurant’s famed roasted chicken (except here, it’s pot pie with black truffles). And make sure to order one of the famous cocktails, which range from the classic (a refreshing, old-fashioned Pimm’s Cup) to the over-the-top like a $198 Viuex Carre made with 50-year-old cognac and rare Sazerac rye whiskey. This is a steak restaurant first, but the best seats are at the bar, where you’ll want to order a cocktail to start. Don’t order a $24 glass of wine, unless you must. The 1930s vintage of the place might prompt you to pick a Martini, a Manhattan, or an Old Fashioned; barkeeps will do right by all of the above. Once you land a stool, though, barkeeps will happily unfold a napkin in front of you if you decide to chase your martini with a burger or a ribeye. Who’d have thought you could pull off the “quiet tavern” vibe in the East Village, home to all-you-can-drink brunches, dive bars, and Little India’s renowned row of chili pepper-light restaurants? The Eddy is a haven in a storm of roving bachelorette parties and bros doing shots—all white-washed brick, dark wood, dim lighting, and a happy murmur among its grateful regulars. There’s a short, smart wine list, but most are here for the cocktails, such as El Scorcho, a mescal-rum number spiked with pineapple and lime, or the Banana Bread, which mingles Scotch with banana, sea salt, sherry, and walnut liqueur. The little round marble bar and a whiff of New Orleanian dishabille catch your attention first. This Williamsburg standby is renowned for its cocktail program, oyster happy hour, and general Southern Gothic vibe. The light, which pours in, is made for Instagram, and you’ll see brunchers taking full advantage of it. Absinthe addicts, attention: This is your bar. There’s a whole separate menu devoted to absinthe cocktails, a real vintage drip in-house, and barkeeps who know what they’re doing with it all. Brews are locally sourced and tasty, and the non-absinthe drinks shine, too. This is the only place for a drink after watching the sun set from The High Line, and it’s a treasure for this part of town, where Irish dives are still the main go-to. Surprisingly spacious, with dark brick-lined walls lending an air of coziness, this Danny Meyer joint has his signature hospitality in spades. Most people roll in for the cocktails, which at $15 a pop are standard for the city nowadays. Try a sherry cobbler or a New York sour—classics for a reason—or inquire about a favorite. They’ll likely be able to create yours. Although it’s been popping up on tourist guides with increasing frequency, The Rum House still feels cozy and welcoming—a proper respite from the madness of Times Square. Rum, rum, and more rum: You want a “daiquiri your way” (classic, dark, pineapple-tinged or Hemingway-esque) or an extravagantly coconutty riff on the Piña Colada called “The Escape.” For fun, look for obscure rums, such as the buttery Zafra Master’s Reserve. If you want to stick to your usual bourbon Old Fashioned or French 75, they have those, too. Arguably the originator of the old-timey Brooklyn vibe, Prime Meats has the stamped tin ceilings, low lighting, vintage mirrors, and dark wood you’ve seen all around the borough in the years since. They just do it better here. You’ll want to hunker down with a steak or a cocktail and stay a while. This is a lovely place to take Brooklyn first-timers. At brunch, when the sun shines in on the bar—where you can order the full menu at any time—it’s about as Brooklyn as it gets. Inside the former Milk & Honey space, the speakeasy vibe remains for this iteration, and the bespoke cocktails served today would make Sasha Petraske proud. If there’s a beer or wine list at Attaboy, it’s irrelevant. Everyone has a cocktail in hand—a pricey one. This is a menu-free environment, so bring your inner cocktail nerd and any questions you might have. Sam Ross, founding co-owner, invented the Penicillin, and if you haven’t tried that combo of ginger, lemon and Scotch before, let today be the day. This triple-tiered bar could be a metaphor for class in New York City: The ground floor is full of groundlings swilling beer and ordering Negronis. The second floor is home to some of the best drinks in the nation, and you’ll battle your fellow cocktail aficionados amiably for a table. The uppermost, most intimate echelon is a private room for parties, which you’ll get into only if you know the right people. Named the “Best Bar in the World” by Tales of the Cocktail, an industry association, Dead Rabbit has a suitably vast menu featuring tons of detail about the bar itself, the drinks’ histories, and their flavors. “Come on in and meet your future ex-wife!” blares the sign outside The Patriot. (Underneath, in smaller letters: “PBRs, $2.50.”) This neatly summarizes the charms of this downtown saloon, where bras hang from chandeliers, drinks are cheap, a sombrero-wearing gator on a surfboard dangles from the ceiling, and no one really wants to leave. Come here when it’s your turn to buy a round, when you want to shock the unshockable friend from out of town, or when you feel nostalgic for the college dives of your younger days. Stock up the jukebox right when you walk in, because there’s some good stuff. At Bemelmans, Ludwig Bemelman's illustrations—you might remember them from the Madeline books—adorn the walls. In one panel, a bunny smokes a cigar in Central Park; in another, a man hands a boy a clutch of balloons. This is a bar where gawking is permissible. The cocktails here very much depend on who’s making them: an Old Fashioned might be a bit watery, a whiskey sour too tart. But often a dirty gin Martini is just perfectly executed. Everything is expensive—it’s clear why you’re here—so take the edge off that sensation by digging into the free, hearty snacks that float your way. If you’ve squeaked past the gatekeeper—unless you’re here precisely when it opens, you’re going on his list—notice the gate itself, with its heavy, Hobbit-esque handle, all feathered wings entwined with snakes. Death & Co cropped up on New Year’s Eve, 2007, and made one hell of a splash. The drinks were so precise, containing instant classics now mimicked nationwide, that it lured talent who have since opened their own famous bars. Look for OG drinks such as Phil Ward’s Oaxaca Old Fashioned, a mix of mescal, tequila, agave, Angostura and flamed orange peel. Things get much more esoteric than that, though, so flip through the huge book to see what you might want. The lights over the booths are intimate and old-timey, and the decades-old bar itself—note the quadruple-paneled mirror by the cash register—is stunning. Folks throw on their nice pair of jeans, or some good earrings, to come here. Co-owner Toby Cecchini (who, incidentally, invented the Cosmo at The Odeon many years ago) has a following, and his cocktails are known around the city, so it’s a bit of a see-and-be-seen along the bar. The menu sports a short list of classics—which would be disappointing if you didn’t know the caliber of your barkeep. That’s Phil Ward, formerly of Manhattan mezcal palace Mayahuel, shaking up a Ramos Gin Fizz on request. Over there is David Moo, owner of Quarter Bar, whose Sazerac is an Absinthe-rinsed dream. Ask for your favorite cocktail or rip through a mix of flavors you like; you’ll end up happy either way. This subterranean Art Deco cocktail bar is hidden beneath The Happiest Hour, which is more chaotic. And thank goodness: Slowly Shirley is just the thing for promising dates, silky drinks, and design nerds coming to check out the Old Hollywood vibe, replete with faux golden Oscars. Most everyone has a shimmering cocktail in hand, which have a lot going on: The Chinatown Daiquiri mingles rum with strawberry, honey, lime, ginger, and Sriracha, and that’s one of the more straightforward concoctions. Bartenders have chops, so they generally pull it off: a co-owner hails from Pegu Club, and you can tell by the drinks. Funny to think that two gents from Northern Ireland could conjure such a Hemingway-in-Cuba vibe. A waitress hands you a tiny frozen daiquiri in greeting, there are ferns galore, and a knockout stained glass panel shimmers overhead. It can be a bit overwhelming here, but BlackTail has some of the best cocktails downtown—along with famed sister bar The Dead Rabbit. Take your time with the fat menu; there’s every texture, fruit, and flavor you could be craving, from the fiery Ventriloquist (made with a habanero chili shrub) to a strongman of an El Presidente, tricked out with mezcal, two vermouths, rum, and Curaçao. That a bar in the heart of Times Square is so tourist-free is one of many mysteries at Jimmy’s, a boxing memorabilia-saturated spot once dominated by the midtown media set. In one snapshot, owner and former boxing trainer Jimmy Glenn poses with the late Muhammad Ali. If you’re lucky, Jimmy himself will be here and can tell you a long story or a short one, depending on his mood. For escaping Times Square hysteria, this will do the trick nicely. Especially if you have visiting out-of-towners in tow who, bless their hearts, really only want to see Times Square. It’s a way to sneak them a little bit of Real New York. They’ll be grateful.